This week's EtsyInspired shop is Mermaid's Tears. They have jewelry made from sea glass. I love the idea of finding something so beautiful just laying on the beach and making things out of it. The designs vary from whimsical to elegant. This week, Mermaid's Tears is offering one item valued up to $25 as a prize. 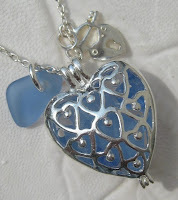 ~Go to the Mermaid's Tears shop and find an item to be inspired by. ~Make any creation that you would like and post a on the EtsyInspired #97 post on the EtsyInspired blog by Friday, July 23rd by noon Pacific time. ~Please give credit to the shop/item you found your inspiration from. Here is my card for this week. It is inspired by the heart piece above. The background is actually purple and silver foil paper, the peachy tone you see on the card is ME. Teehee. They paper is from Kaisercraft, Lilac Avenue. The doily is from my friend Sarah's shop. And the stamps are from Clear and Simple Stamps. I'm also entering this is Moxie Fab World's Classy and Elegant challenge. Beautiful, Ashley! You have captured the delicate feel of the inspiration! Gorgeous! I love the elegant feel to this card. I almost used this one as my inpsiration! LOVE YOUR TAKE ON IT! 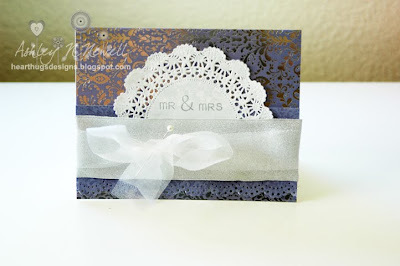 The colors and doily are too perfect! Good luck with the Moxie Challenge, I was thinking of entering it too! Did you try the blog hop tonite? Lots of stuff you can win? Visit moxie world's blog! This is GORGEOUS Ashley! Perfect wedding card! Elegant! This is one fabulous card. Love the colors and design. Great inspirational piece too. Very pretty! Love the use of the doily! this is super sweet ashley, and cute doily, wink wink! Love that lacy doily ... classy & elegant for sure. This is so pretty! I love how you've used the doily! Great job with the Moxie Fab challenge! !